Sen. Rand Paul Makes Unofficial Visit To Moscow - Joe.My.God. Sen. Rand Paul, one of President Trump’s more eager defenders on Russia, jetted into Moscow on Monday in a bid to increase engagement with the country. 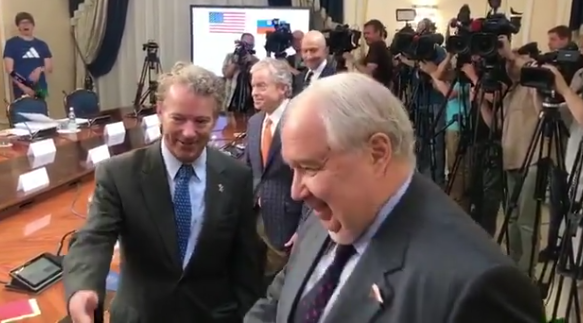 Paul (R-Ky.) met with several Russian senators including Sergey Kislyak, Russia’s former envoy to Washington and a key player at the heart of the election meddling scandal that continues to rock relations between the United States and Russia. In a meeting at Russia’s upper house of parliament, Paul also invited Russian lawmakers to meet with U.S. Congress members, in Washington or elsewhere, Interfax news agency reported him as saying. “I think this is in­cred­ibly important,” Paul said after the high-profile sit-down. Monday’s whirlwind visit to Moscow, however, was not part of official diplomacy. “Sen. Rand Paul is visiting Russia as part of a private group,” said a spokesman from the U.S. Embassy in Moscow. “Trump’s hands are tied behind his back, he can’t advocate for greater cooperation between our countries. Because all this will look like: “Oh, you love Russia!” Sen. Rand Paul (R-KY) said speaking in Moscow at a meeting with Russian lawmakers according to Russian state media. Hey @RandPaul , have a nice trip to Moscow. Travel hint: bring alotta lube! Travel hint 2: consider not coming back.